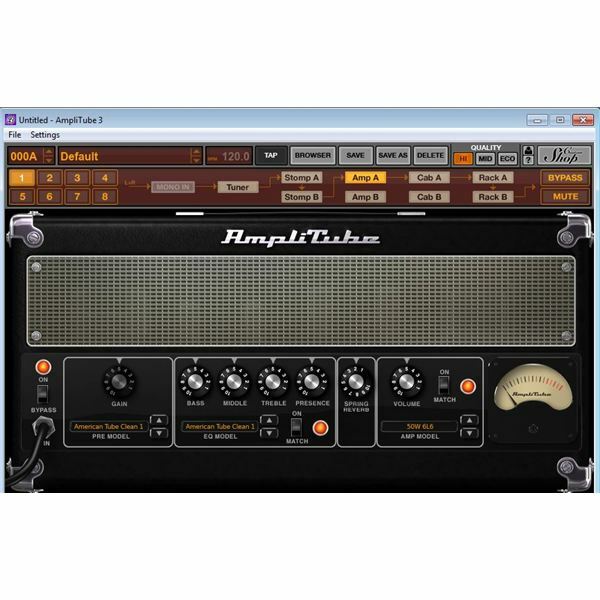 IK Multimedia has released a free version of its popular AmpliTube 3 program. The no-cost version comes with a few free amplifiers, cabinets, microphones and effects. With the hookup of a USB interface to a musical instrument such as a guitar or bass, the program creates the sounds of famous musical equipment such as those made by Fender or Marshall. Users can use a four-track which is included with the program to record their music. Within the program, users can purchase new amplifiers, effects and other sounds for a fee via the guitar shop store. To use the free version of IK Multimedia AmpliTube 3 you’ll need a few things. A device such as the IK Multimedia Stealth Plug is a good choice for a USB interface but most other devices will also work. 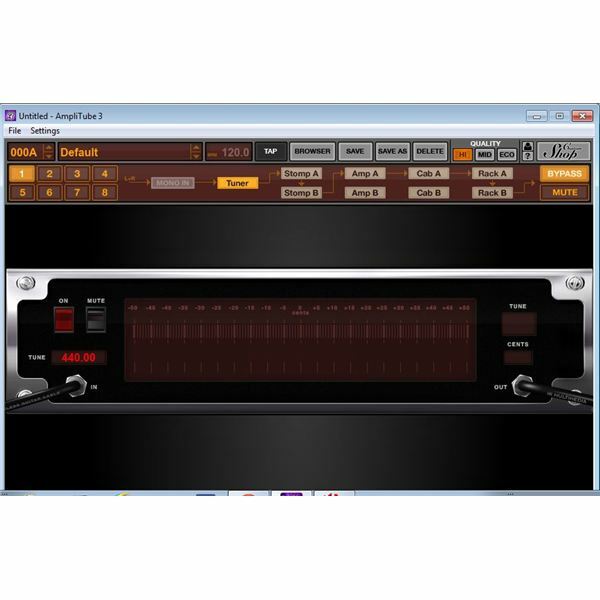 I am using a Line 6 Tone Port UX1 device with the software. Consult your USB documentation for setup on your computer system. Once your USB device is set to go you can download the free version from the website after you create an account with them. Before you install it, make sure you also download the authorization manager which will authorize your free version of the software for use. Once the program is installed, you’ll need to set your USB interface. Under “settings” go to the audio/video and select your ASIO device so you’ll hear sounds. To the far right of the program, select low, medium or high sound quality. This will vary depending upon your computer speed and you may get a better sound by selecting a lower quality. Once you have set up your sound device you are ready to start making music with the program. Plug your instrument into your device and adjust the sound levels to your taste. The interface of the program is quite easy to use. At the top you’ll find the file menu and settings. Below this is the “presets” where you can pick from a number of included sounds as well as user-created sounds. The browser button takes you to the preset list which you can scroll or search through. Also on the top are the save, save-as, and delete buttons. The “quality” section allows you to set the sound output of the program. Below these buttons are the settings where you can begin to make your music with the modeling software. The program comes with 24 models: nine stomps, four amps, five cabs, three mics, two rack effects and the tuner. Click on the top of the program and select “amp.” From here you can select whatever amplifier you want. Creating sounds is as simple as playing with the buttons on the amplifier just like you would with a real amplifier. You can adjust volume, middle, treble, reverb or whatever else is included with the amplifier. Next you can select a cabinet, pedals and microphones. Getting a decent sound requires some experimenting just like you would do with your gear at home. Included with the program are many presets to get some common sounds or tones. Included with the program is what is called the Custom Shop. While the free version has a few amplifiers and other gear already provided for you, the Custom Shop gives you the opportunity to expand your sound selection. Click the Custom Shop and browse through the various effects, amplifiers and cabinets all modeled after famous brand names such as “Fender Twin.” You can try any of the gear for two days and see if you like it or not. Be sure to have the Custom Shop open when you try out the gear or you won’t see it inside the AmpliTube 3 program itself. If you like the gear you can make a purchase and have it appear inside your program ready for use at any time. If you want to record your music, there’s the four-track located at the bottom of the screen. Note that if you are using a netbook you won’t be able to see this, so you’ll need a full screen monitor to access all features of the program and use the four-track. You can also use this to slow down songs with the speed trainer feature to learn passages of music or playing along with your favorite song. You can, of course, use your favorite DAW (digital audio workstation) to record your music from. The included four-track is a nice addition but it doesn’t have the full features of a complete audio workstation. This program gives players the chance to experience all the sounds the full version has to offer. With the Custom Shop you can download only the models that you like, which saves you time and hassle. The full program does come with more included sounds but the free version is well worth using with the new Custom Shop utility. Article was written based on the author's experience with the program.